The maximum voluntary ventilation was formerly recommended as a more specific test for muscle weakness than volume measurements but, in practice, the proportionate reduction is usually similar to that of VC (18, 19). Disproportionate reductions may be seen in Parkinson's disease (20), in which the ability to perform frequent alternating movements is impaired. Recommendations and requirements are covered elsewhere (10). The test depends on motivation and is tiring for the subject. Maximum voluntary ventilation is not generally recommended for patients with known or suspected respiratory muscle weakness but may be helpful in the assessment and monitoring of patients with extrapyramidal disorders. Figure 3. 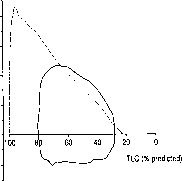 Schematic maximum expiratory and inspiratory flow-volume curves in a patient with severe respiratory muscle weakness (solid line) compared with predicted (dotted line). Volume is expressed in absolute terms (i.e., percent predicted). Note marked reductions in FVC, VEmax at higher volumes, and Vimax at all volumes. Note also the blunted contour of the expiratory curve and the abrupt cessation of VEmax at RV. In the midvolume range, VEmax exceeds that predicted for the absolute lung volume. In chronic muscle weakness, even when quite severe, PaO2 and the alveolar-arterial Po2 difference are usually only mildly abnormal (2, 21). In acute muscle weakness, PaO2 may be more markedly reduced, but the picture may be complicated by atelectasis or respiratory infection (22). With mild weakness, PaCO2 is usually less than normal (19, 22), implying alveolar hyperventilation. In the absence of primary pulmonary disease, daytime hypercapnia is unlikely unless respiratory muscle strength is reduced to < 40% of predicted and VC is reduced to < 50% of predicted (19) (Figures 5 and 6). Elevation of venous bicarbonate concentration occasionally gives an important clue to otherwise unsuspected hy-percapnia. 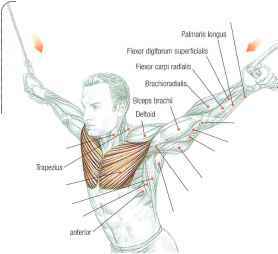 Patients with muscle weakness are less able than normal subjects to compensate for minor changes in respiratory function. If hypercapnia is established or incipient, even minor infections may cause a further rise in PaCO2, as also may injudicious use of sedative drugs or uncontrolled oxygen. Arterial blood gases assess the major functional consequence of respiratory muscle weakness. In patients with Duchenne muscular dystrophy, hypercapnia has been shown to predict shorter survival (12). Figure 2. Curvilinear relation of maximum static inspiratory pressure (inspiratory muscle strength) to vital capacity in 25 patients with chronic weakness of varying severity. Dashed line and statistics relate to logarithmic regression. Solid line represents relationship calculated from a standard maximal static pressure-volume diagram assuming normal elastic properties of the respiratory system. The greater than expected reduction in VC is due to reduced compliance of the lungs and chest wall. Reprinted by permission from Reference 5. Figure 4. Maximum expiratory and inspiratory flow-volume curves, showing "sawtooth" oscillations of flow.